This historical overview is compiled from excerpts taken from the booklets "The Village of Luther" and "Country Roads Lead Home"
The arrival of the pioneers in 1862 brought settlements and homesteads to the area; Grand Rapids was the starting point for the journey to this undeveloped country. The pioneers loaded their belongings and implements on lumber wagons (which also served as stagecoaches) and set out for the North Country. The eastern boundary of the township near the Little Manistee River came by way of State Road. The State Road was a road north from Grand Rapids, perfectly straight to Traverse City, cutting through hills and vale covered with stands of virgin timber. It served primarily as a freight line, many pioneers journeyed this route in search of undeveloped North Country land for their homes. The main street of Luther is a part of that frontier trail. The State Road later became the boundary between Ellsworth, Dover, and North and South Newkirk Townships. The original plat of Luther was recorded March 13, 1882; Luther lay on both sides of State Street placing part in Ellsworth Township and part in Newkirk Township. In 1871 Newkirk Township was called Killbuck, until it became Glencoe in 1875. Glencoe was deactivated and became part of Newkirk Township in 1899, the size (12X6 square miles) and location of the township has remained the same since that date. Newkirk Township was named after Henry Wirt Newkirk who moved to Lake County in 1886 to publish a newspaper, the Luther Enterprise. He was appointed Lake County prosecuting attorney in 1889 and was elected to that office the following term; he was then elected to the State House of 1893-94. Small settlements sprung up, one is Careyville (Carrieville) which was originally platted in 1883, located on Kings Highway in section 15 of South Newkirk Township. In its prime of 1885 it boasted a population of some 300 people. Its beginning centered around the lumbering business. Beautiful stands of virgin pine were the first trees cut. It is very difficult for us today to imagine the size of these trees, but keep in mind that they had been growing for hundreds of years, untouched by any human existence or interference. The size of some deteriorating pine stumps, still found today, attest to the trees' immensity. The logging business tended to follow rivers, cutting through the wilderness from the riverbanks. To the North of the township it was the Pine River and to the south, it was the Little Manistee River. Many lumber camps sprung up along these rivers. Two railroads ran through the area, the Grand Rapids and Indiana Railroad began laying track to Luther in 1882. It was a spur line running from Orono to Deer Lake, Totten, Luther and Careyville. In the late 1880's the Manistee and Grand Rapids Railroad was built through Luther, primarily it was a passenger and freight line built by lumber magnates from Manistee. An important attraction to the lumbering business was the "turntable" for the Grand Rapids and Indiana railroad, it was located at Careyville. A turntable is just that- a table whereby trains coming to the end of the track could be turned around and headed back in the opposite direction. Farming replaced lumbering on the lands cleared of trees and by 1904 the area lumber industry had diminished to the point that the Grand Rapids and Indiana Railroad depended solely on the mail contract for it existence. The mail contract for the railroads was eventually discontinued and service ended in 1920. The vast stands of virgin timber were eventually harvested by the lumber companies so that by the early 1900's little timber remained. As the lumber diminished, likewise so did the population. Careyville (Carrieville) had dropped to under 50 people and in 1905 it was listed as a "discontinued post office". Large and small area farms abounded in the 1930's, the only source of income was to work the land, but as the population diminished in the late 1930's, the local business operators began to rely more and more on tourist revenue. Deer and small-game hunters, along with trout fishermen, started flocking to the region. Lake County had a closed deer season for several years and the deer herds grew to tremendous proportions in the late "30's". It was normal to drive the back roads of the area at sunset and see a hundred or more deer in a herd. The Conservation Department finally opened Lake County to deer hunting and virtual armies of hunters filled the woods. To this day, a large measure of the local economy is based on tourists who come here to hunt, fish, pick mushrooms, and enjoy our beautiful rivers, lakes, streams, campgrounds and recreational trails. Newkirk Township contains 22,615 acres of the Pere Marquette State Forest and 3,935 acres of the Manistee National Forest. Popularity has grown for the sports of ATV's, snowmobiling, cross country skiing, and hiking the miles of State and local trails, which encompass Newkirk Township. The trails are maintained and groomed for the safety and pleasure of the people who call this area home, some of whom are 4th and 5th generation families from the early pioneer era. 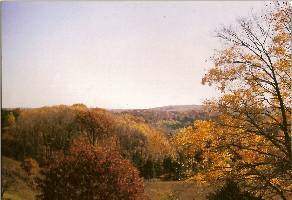 This is an area that attracks vacationers, and the many retiree's who have settled here and discovered the joy of experiencing the scenic natural beauty of Newkirk Township.